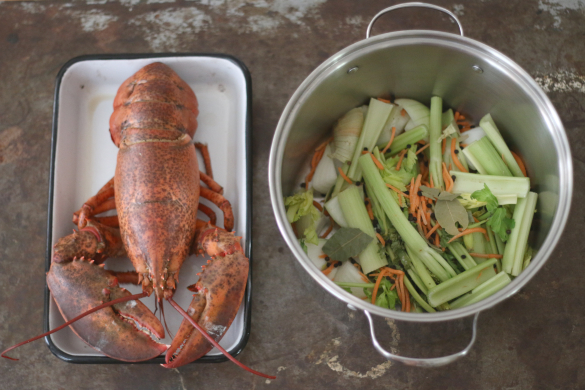 I certainly did not buy a lobster to make a lobster seafood stock but I did recently incorporate lobster into my make-at-home lobster rolls and wanted to take advantage of having fresh lobster shells — so a seafood stock had to happen. 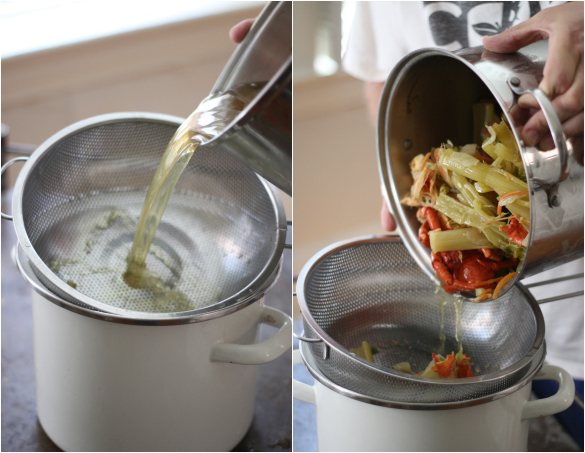 Stocks are are one of my favorite staple ingredients to make at home. They use up leftovers and store really well in the freezer for portioned use. After rinsing the cleaned out shells under cold water to remove any unwanted matter in the stock I added celery, onions, shredded carrot, bay leaves, salt and some black peppercorns along with 6 cups of water in a large stock pot. 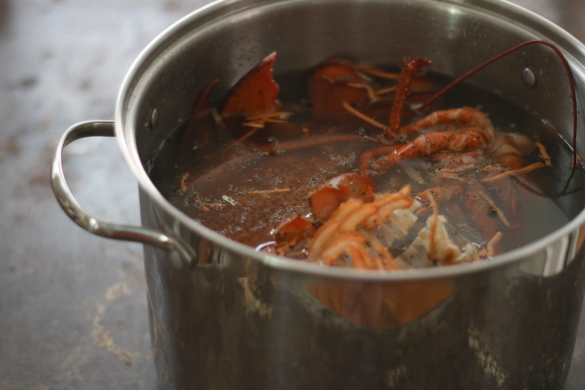 Bringing the pot to a boil and then simmering for about 40 minutes, the house took on amazing aromas. After 40 minutes I removed the stock from the stove and placed it in the refrigerator to cool. After 4 hours I strained the stock. 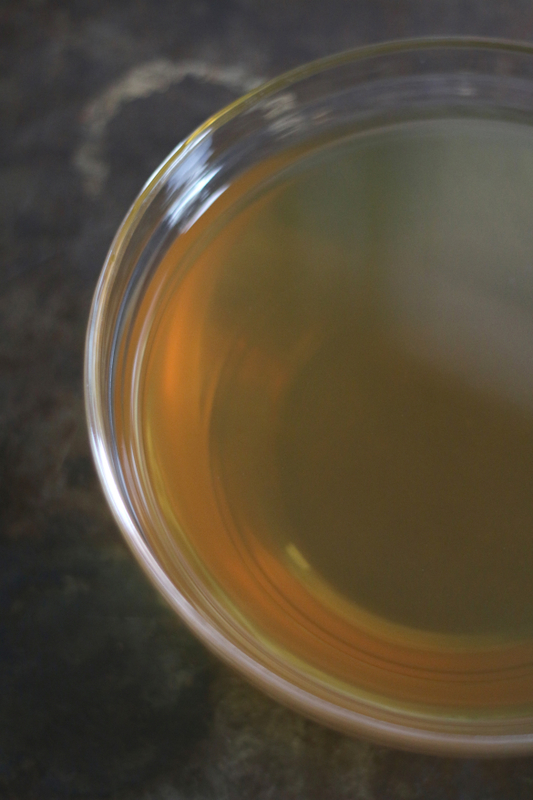 At this point taste the liquid and adjust for salt — homemade stock will not be as salty as purchased stock so you can season to your desired liking. Except for the 4 cups I was using for a recipe the rest was placed in a container, labeled and frozen for use later. 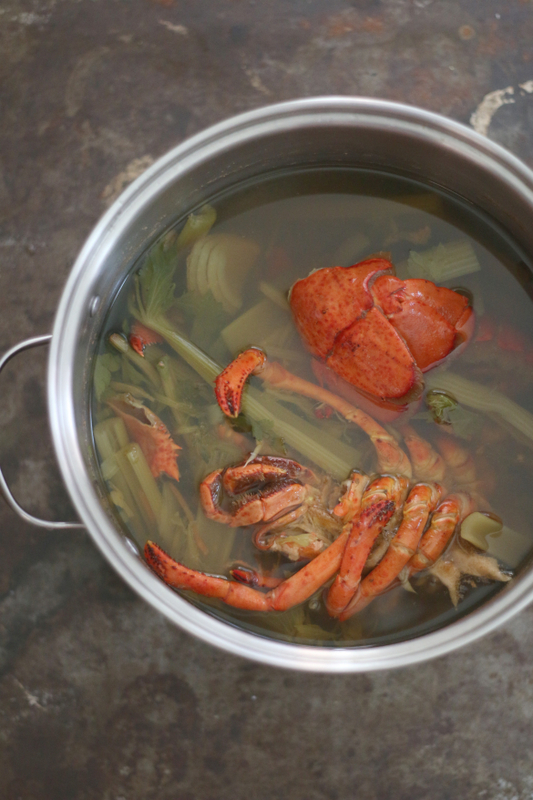 Since we've already made chicken, turkey, and beef stock here before, this seafood variation rounds out the the most used in the stock family. The concentration of homemade stock is so much stronger than the store bought version, it's simple to make and a resourceful way to save a little money, knowing exactly what your stock is made of.